What Are the Dangers of Rice Cakes? Rice cakes can be eaten plain or combined with a number of different foods for a quick, healthy snack. The cakes are a popular choice for people on a gluten-free diet and for low-residue dieters. The low calorie and fat content helps dieters who have used the cakes in an attempt to lose weight. Despite its popularity as a food that can prevent unhealthy snacking, a number of problems are linked to consumption. Rice cakes are usually made from puffed whole grains of rice, but some from other countries, such as Japan and China, are made from ground rice. A plain rice cake has low fat content and contains little sugar. The protein content is low or absent, and the main source of calories is from carbohydrates. The cakes are lower in calories per serving compared with other starchy products -- 35 calories for a plain 3/10 oz. cake compared with 58 calories for a 2 2/3 oz. serving of white potato. The main minerals in rice cakes are manganese, selenium, magnesium and tryptophan. Overall, the cakes have low nutritional value, and the vitamin content is low, mainly vitamin E, K and B. The protein in rice cakes is incomplete, which means that it does not have enough proportion of essential amino acids. You can add legumes, such as beans, to supply the amino acid lysine, however, to make the snack a complete protein. With the number of different flavor varieties of rice cakes available today, it is more difficult to compare them. Extra sugar or fat is added to flavored rice cakes making them higher in calories. For example, a 5/10 oz. caramel rice cake has about 45 calories and a 6/10 oz. cheddar cheese rice cake may contain 70 calories. The sodium content in plain rice cakes is low. Yet the sodium content can be relatively high in flavored varieties, such as cheddar cheese (3/10 oz. of sodium in a 6/10 oz. cake). Calories are important when you are on a diet, but you need the right type of calories. Rice cakes provide carbohydrates but no fiber or proteins. Rice cakes are not filling, and if you are on a diet, you want food that satiates you fully. The GI index is a measurement of a person's blood sugar after eating a certain food. Foods with a low GI index, such as oatmeal and spaghetti, make you feel fuller for longer, helping you eat fewer calories. Foods that rapidly raise blood glucose levels create a high insulin demand, which affects people with diabetes. Rice cakes have a high glycemic index of 87. Other high glycemic foods are white bread, with a GI index of 71, and cornflakes, with an index of 80. 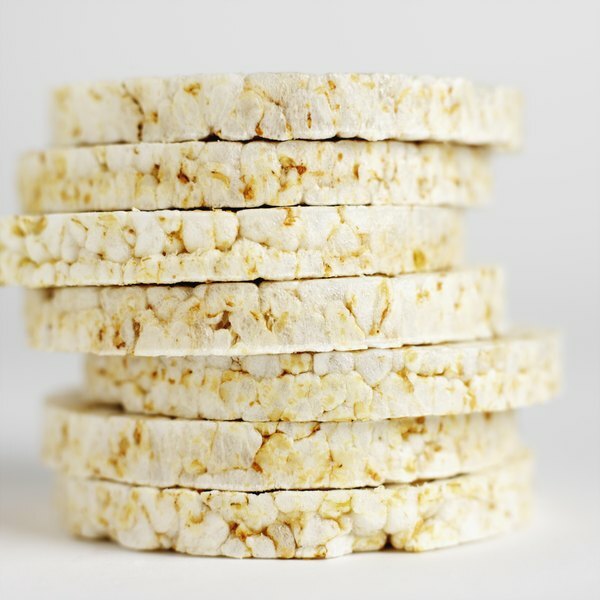 Adding a topping to a rice cake can lower the whole GI index of the snack. For example, peaches have a GI index of 28, while pineapples have an index of 66. Glycemic Index: What is the Glycemic Index?